Executive Chef Javier Viramontes at Las Brisas Ixtapa in Ixtapa-Zihuatanejo, Mexico shares his culinary vision and tantalizing seafood recipes that showcase the bounty of Ixtapa-Zihuatanejo. Ixtapa-Zhihuatanejo is located on the Mexican Pacific, 140 miles (225 kilometers) north of Acapulco, and as such has access to the freshest possible seafood, which Executive Chef Javier Viramontes utilizes in his creative cuisine for the hotel's 6 restaurants. 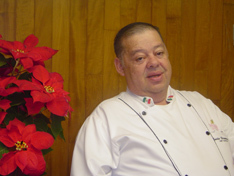 I had the pleasure of experiencing his culinary excellence during my stay at Las Brisas Ixtapa in December 2007. He began his professional culinary training in Acapulco at the Marriot Hotel Chain, and later honed his skills in Mexico City, as well as in Venezuela where he worked for the Posadas de México Group, before joining Las Brisas Ixtapa, his culinary home for the last 14 years. Chef Javier finds inspiration for his recipes by discovering new flavors, and enjoys the look of satisfaction on the clients' faces as they savor his food. When not in the kitchen creating new recipes, he enjoys spending time playing with his three-year old grandson; perhaps there will be another chef in the family in the future! Method: In a food processor, chop the lobster, and then add the rest of the ingredients and process to meatball consistency. Roll the mixture into lobster meatballs. Fry the lobster meatballs in olive oil until cooked. Remove from the pan and drain on a paper towel. Place meatballs in a casserole dish, cover with the green tomato sauce, top with mozzarella cheese and bake in the oven until hot and the cheese has melted. Method: Bake the green tomatoes with onions and garlic until golden and juicy. Sauté the mixture with a little olive oil. Finish by adding the wine, and salt and pepper to taste. Cook the linguini al dente, drain, and then sauté with butter and garlic. Presentation: Remove the lobster meatballs from the oven. Place the linguini on a plate and arrange the lobster meatballs and the sauce on top. Method: Blanch the pasta in a pot of salted water for 7 minutes and stir. In a pan, sauté the garlic, onion, and red pepper, and then add the white wine and let it reduce by half. Add the cubed lobster meat and cubed salmon and sauté in the reduced sauce. Add heavy cream and the velouté. Mix the pasta with the rest of the ingredients and season with the green pepper and salt. Garnish with the spring onions and sprinkle with the Parmesan cheese. Please read more about Las Brisas Ixtapa in the Destinations, Hotels and Resorts, Chef's Recipes (Spanish), and Restaurants sections. Please read other articles on Ixtapa-Zihuatanejo in the Destinations, Hotels and Resorts, Restaurants, Chefs' Recipes, Music Scene, and Adventures sections.